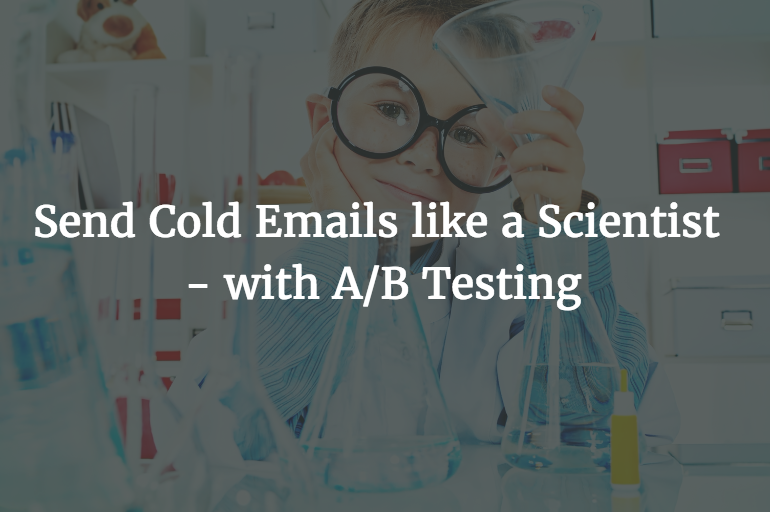 Cold emails can be one of the most effective channels of lead generation. But – only if you can get those emails delivered to your prospect’s mailbox. 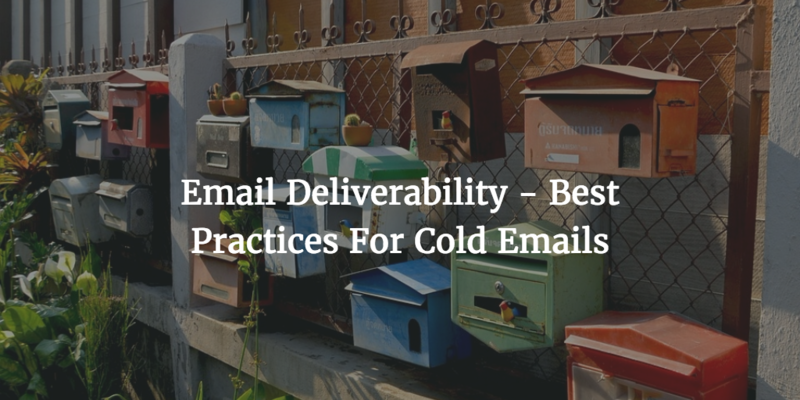 So, email deliverability is the single most crucial factor that determines the success or failure of your cold email campaigns. 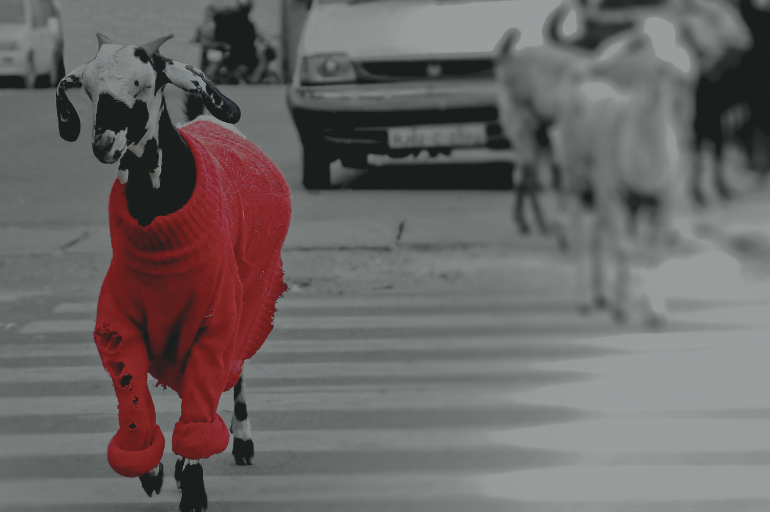 If your cold emails are not getting delivered, then crafting that perfect call to action or that creative subject line or that ever so cheeky but personalized complement will have no impact what so ever. 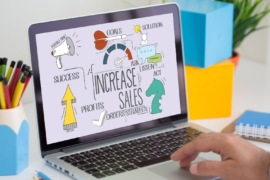 As you start your cold email outreach, it is important to keep in mind various factors which can impact email deliverability and build them into your outreach strategy. When this happens often, the impact on your reputation can be quite drastic and immediate. The corollary to this is that as more and more people open your emails, add you to their contacts and send you replies, your reputation improves quite fast as well. Email service providers look at data such as volume, overall bounce rate etc to determine if you are engaged in suspicious activity. It is important to build up your reputation with Email/ Internet Service providers over a period of time. More and more companies are investing in sophisticated spam filters. It is important that your email content and templates are well written and your email technical infrastructure needs to be properly setup. One of the easiest ways to kill your email reputation is to have multiple prospects report you as spam. This can have a fast and immediate impact on your email deliverability. A simple way to reduce the likelihood of you being reported as spam is to make it easy for your prospect to unsubscribe. 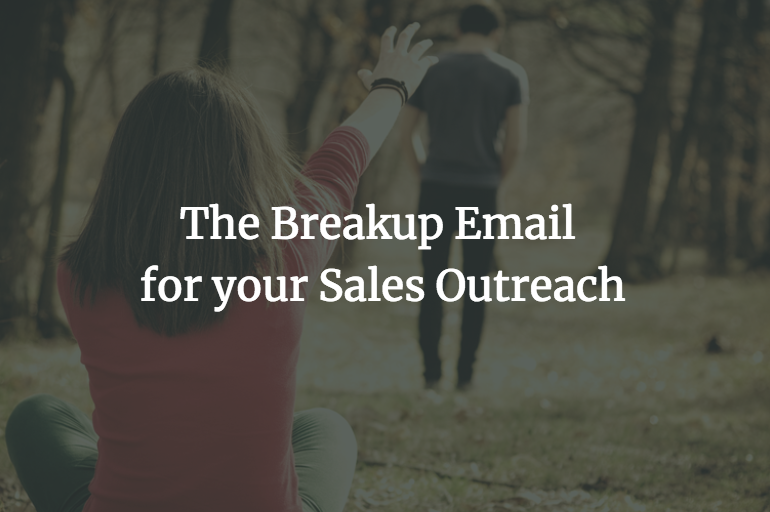 Provide unsubscribe links at the top/ bottom of your emails, so that if your prospect is not interested in hearing from you, he can quickly and painlessly opt out without having to mark you as spam. If your prospect chooses to opt out, make it frictionless. Don’t ask them to re-enter their email id/ username or pass additional hoops. When doing cold outreach, it is almost always a bad idea to pull a list of 1000 emails and send them a completely generic email with no targeting or personalization. There are various ways to make your outreach more personalized. Either spend some time on research and add some personalized touches to the email. Or segment your prospect list into smaller and smaller niches such that you can craft a personalized message that is specific to each niche. 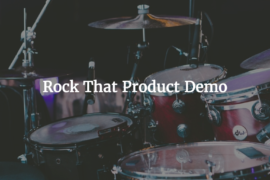 Reach out to prospects who actually might be interested in your product/ service rather than sending blanket outreach emails. Don’t be over aggressive in your email follow-ups. Wait for a reasonable time frame between each follow-up. Sending 4 emails in 3 days is more likely to irritate your prospect than 4 emails over a 20 day period. Even if your prospects have not marked you as spam, if most people are ignoring your emails, then it sends a signal that your emails might not be of interest. The corollary to this is that as more and more people reply to your email or add you to their contacts etc, it sends a strong signal that you are an emailer with credibility and your email reputation goes up. So use your email ids for activities which are not just restricted to cold emailing. Use it to email your friends and colleagues to warm up your reputation. Email service providers and ISPs monitor email activity to ensure that your email usage pattern is consistent with good practice. Start with a small volume of 40-50 emails and warm up your reputation over a period of time. 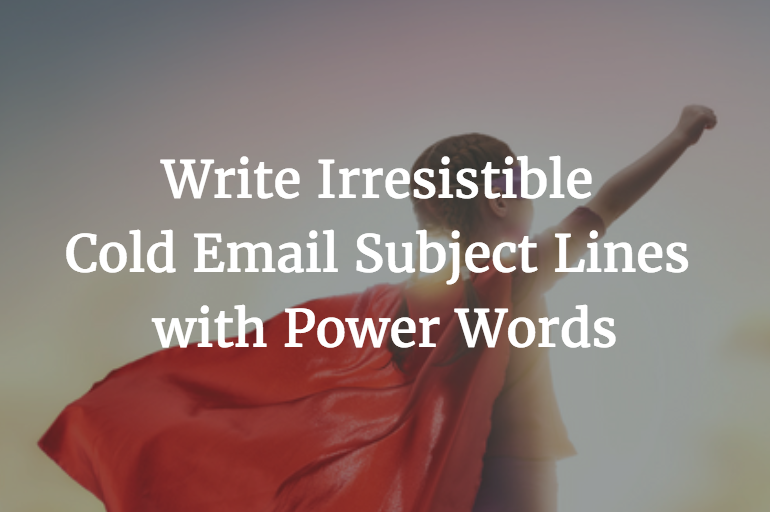 Also, send consistent volumes of email every day. Rather than send 500 emails every Thursday and none for the rest of the week, send 50-100 every day. Over a period of time, you can expand this to 1000+. 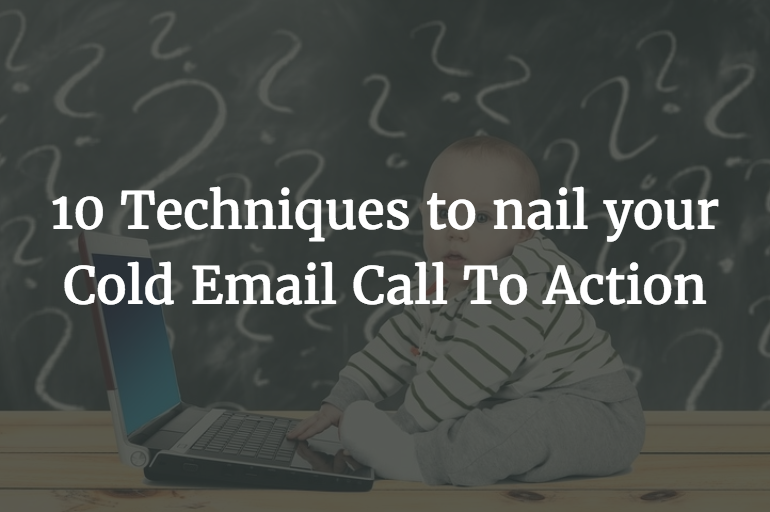 This is especially important if you have created a new email id for cold emailing. If you are using an outbound sales automation software (like Klenty) to send mail merges or cadences, set it up such that there is a reasonable interval between emails. At Klenty for example, we use a random interval of approx 2 minutes between each email sent by you. Sending 100 emails in a minute is a signal that you may be a bulk emailer. The number of bounces that you get is a strong feedback signal to your service provider. The more bounces you get, the more your reputation suffers. This, in turn, will lead to more bounces! It is a vicious cycle that is tough to get out of and your email deliverability will suffer for a long time. Keep your email list fresh, regularly cleaned out and verified from time to time. You can use an email verification service like Briteverify or Findthatlead to validate your emails addresses. At Klenty, we provide an add-on to verify your email addresses before contacting your prospects. Another signal that your Email Service Provider looks at is whether you are sending the same email over and over again. Having personalization tags like First name, Company etc. can help to some extent. If you are using Klenty, you can setup multiple A/B testing options. That way different email templates will be used instead of the same email content being sent repeatedly. 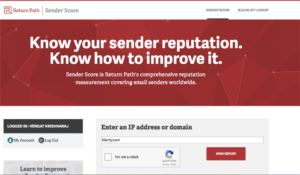 Use a tool like Sender Score by Return Path to keep track of whether your domain/ IP’s reputation is moving up or down over a period of time. If you see your reputation go down, it may be time to cut down on email volume and focus on improving email deliverability. Spam filters are getting increasingly sophisticated in detecting marketing/ sales emails and even if you get past the ISP/ ESP and write a targeted email which provides a lot of value to your prospect, you still need to make sure that you don’t get flagged by your recipient’s spam filters. If you use Klenty to connect to your Gmail or outlook account, then this is taken care of out of the box. But if you are setting up an SMTP server on dedicated IP using a service provider like Sendgrid or Rackspace, then this is quite important. You need to add the appropriate SPF records and DKIM records and verify ownership of your domain – so that the recipient can trust the emails sent by you. In general short URLs and any form of link, tracking tend to have an impact when your recipient has advanced spam filters. For the really sophisticated prospects, you may even want to turn off email open tracking and remove all images. Attachments usually have a negative impact on deliverability. So it would be a good idea to hold off on sending attachments in your first email. If you need to, then upload to Google docs/ Dropbox etc and send the link over. Draft your email template carefully. If it appears overly salesy, has too many exclamation points !!!! , CAPS, multiple colors, too much hHTMLetc. These are all indicators that this might be a spam email and increases the likelihood of it being filtered out. 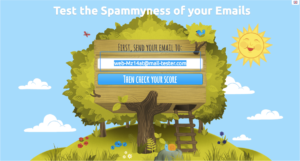 Use a tool like Mail-tester to check whether your template looks spammy and what is the likely deliverability of your emails. Ultimately, every time you send a cold email, you need to ask yourself, is this SPAM? If you are sending emails advertising bulk pharmacy products to an indiscriminate list of email ids, then that is definitely spam. 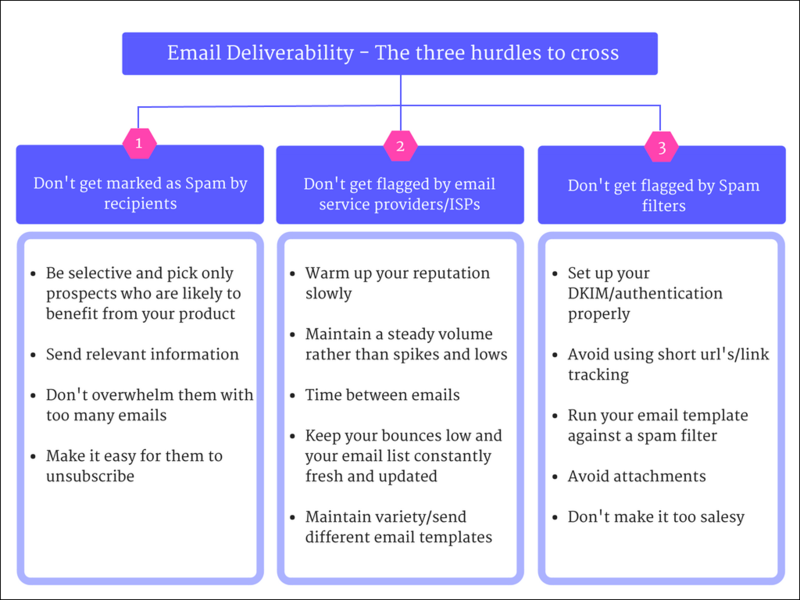 You are unlikely to find yourself in anyone’s inbox in a hurry and your email deliverability will take a nose dive incredibly fast. 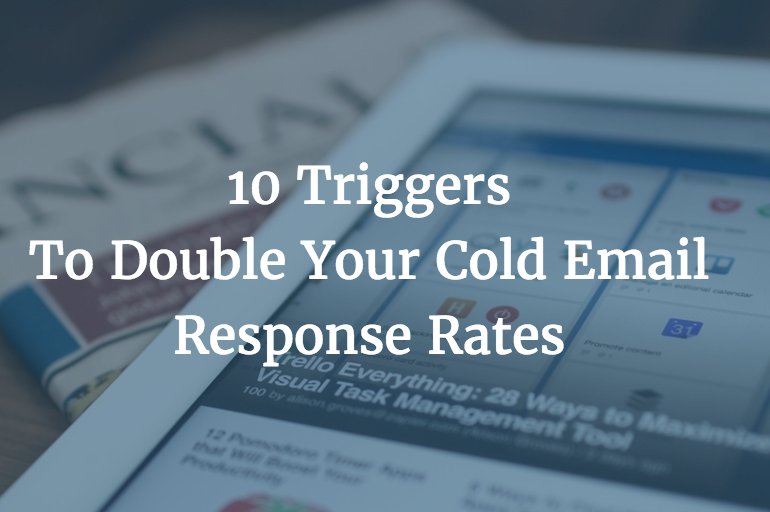 then cold emailing is a powerful and effective channel for you to find new customers.